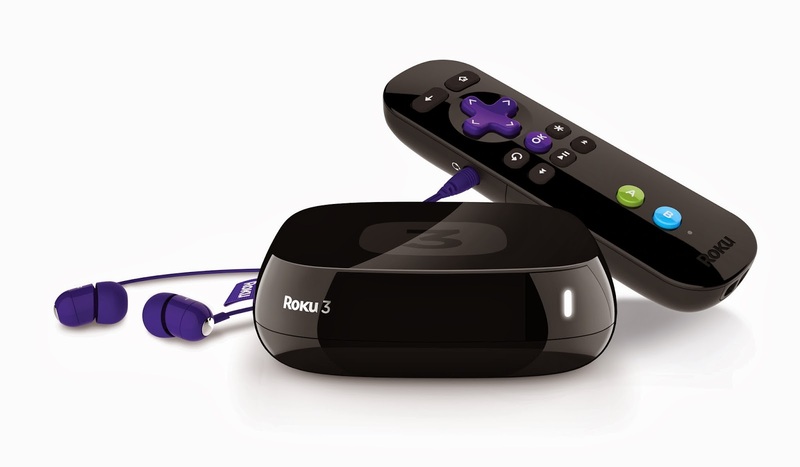 In the new year, make a resolution to SAVE MONEY with the Roku 3! Stop paying for cable bills and start streaming. The Roku 3 Streaming Player redefines effortless, easy-to-use instant, streaming television. Roku 3 comes fully loaded with over 1,000 entertainment channels, 1080p HD support, dual-band wireless, Ethernet and USB capabilities. With on-screen features like one-stop search, you'll quickly flip through a wide selection of streaming entertainment or find that perfect movie or TV show on demand. An enhanced remote includes a built-in headphone jack for private listening. Use it with the included headphones to watch a late-night movie without disturbing your partner. The Roku remote also includes motion-sensing technology for playing games like Angry Birds or Fruit Ninja with a flick of your wrist. Expand even more entertainment possibilities by transforming your phone into the ultimate Roku command center with the free Roku App for iOS and Android devices. This small, black box won't take up too much space either. Roku 3 is the perfect companion for your TV. 1000+ entertainment channels. Choose from the best selection and widest variety of streaming entertainment, including movies, TV shows, music, sports, news, and more. Lightning fast and powerful. Experience ultra-smooth performance with a 5x faster processor and extended-range wireless. Remote with headphone jack for private listening. Use the included headphones and crank up the volume to enjoy a late-night flick without disturbing the household. Motion control for games. Enjoy action-packed games with a motion-control remote. Get the fun started with Angry Birds Space, included free. One-stop search. * Find your favorite movies and shows in a flash from top channels like Netflix, Hulu Plus, Amazon Instant Video and VUDU. Free iOS® and Android™ app. Transform your mobile device into a Roku remote. Browse and add new channels. Even use your phone or tablet to send your music, photos and personal videos*** to your HDTV. All the bells and whistles. 1080p HD support,** Ethernet and USB ports, and a microSD slot. Works with virtually any HDTV.